Another experiment with simulating recursion by chaining subnetworks which take their output as a valid input. The basis of this one is a "house" with a floor, two walls, and a pitched roof. Each new add_houses subnetwork adds a new house to each side of the exposed roofs in the previous generation, forming a tree made of houses. When I played with this I was surprised to see that the tree curved back to from hexagonal rings. To create the animation I use a frame node to drive changes to the wall and roof height of the base "house". But I encourage you to detach those inputs and just play with the three paramours in the house_root node. All sorts of amazing patterns emerge. 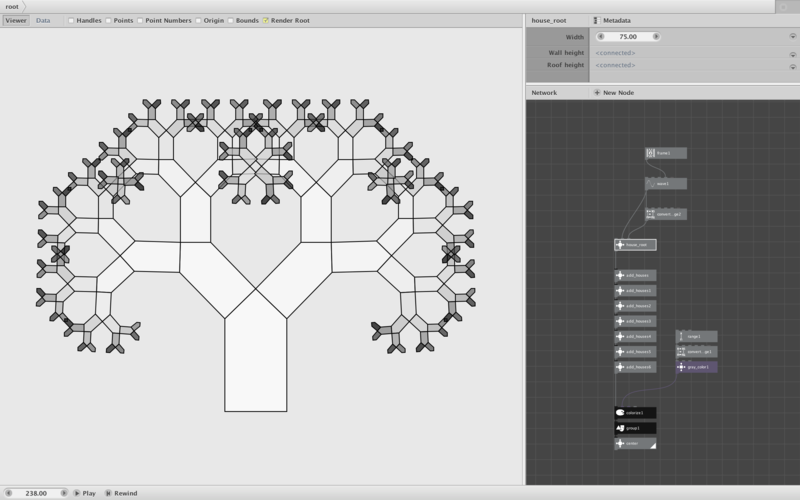 If you want, you can add more generations by sampling adding more add_house nodes.